On Thursday, September 27, 2012, the Seiko Salon in Tokyo opened its doors as usual, but visitors were greeted with a dramatic new display, featuring the new Seiko Astron GPS Solar. The center window of the Seiko Salon in Tokyo’s landmark Wako store in Ginza featured a huge montage of images displayed on about 50 screens, all showing the new Seiko Astron and its remarkable functionality. In addition, the store’s famous clock tower was lit up in blue, symbolizing the global reach of Astron’s astonishing GPS technology, extending to every corner of our planet, with its deep blue colour as seen from space. 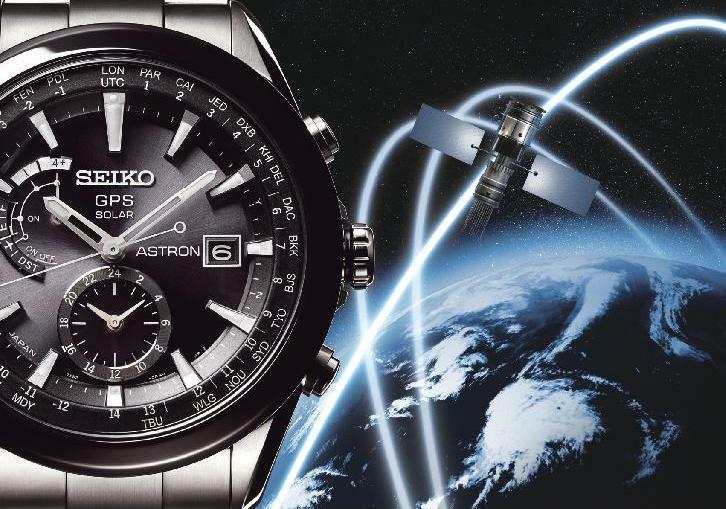 October 10, 2012, sees the international launch of the new Seiko Astron at the Royal Greenwich Observatory, a setting steeped in horological history. Just as the Harrison chronometers that are housed at the Observatory set a new standard of precision and made international travel so much safer, so the new Seiko Astron redefines modern timekeeping by adjusting to every time zone on earth. The new Seiko Astron is the world’s first GPS solar watch. It requires no external power source and is entirely self-sustaining. Using just the power of light, it connects to the GPS network, and tells time with atomic clock precision, adjusting at the touch of a button to all 39 time zones on earth. It took almost 10 years to create the new Seiko Astron and to package its advanced functionality in a watch that is beautiful to look at and comfortable to wear. Like its illustrious predecessor, the 1969 first quartz watch, the new Astron GPS Solar will change the way that the world tells time. To develop Astron, Seiko developed several new technologies and over 100 patent applications have been filed. Only Seiko can deliver what the international traveler has long wanted, a watch that understands and adjusts to time zones. In order for Astron to identify its location and maintain atomic clock precision, it must receive signals from at least four of the GPS satellites that orbit the Earth at a height of around 20,000 kilometers. The challenge was, of course, power; it was necessary to generate up to 10,000 times more power than needed in a standard quartz wristwatch, and about 200 times that of a radiocontrolled watch. After an R&D process that took six years, Seiko finally succeeded in developing a highly efficient GPS module especially designed for wristwatches that, when hunting for signals, does not waste energy tracking satellites for which reception conditions are poor. In this way, the new Seiko Astron GPS module realizes a spectacular saving of power consuming about one-fifth of the electricity of a conventional GPS module. Right from the very start of the project, Seiko determined that the new Seiko Astron must be conventionally sized and easy to wear. The question was how to house the antenna in a watch case. Both the chip antenna, which is widely used in GPS, and the thicker patch antenna have the twin problems of poor receptivity inside a metal casing and large size. Seiko set about designing an entirely new type of antenna that would solve these difficulties. The solution was to invent a highly sensitive ring-shaped antenna that can be stored on the outer part of the round wristwatch case. By placing the antenna under the dial ring, Seiko succeeded in enhancing its receptivity to the maximum degree, a characteristic that is further enhanced by the use of ceramic on the bezel, as this material is superior to metal in the reception of radio waves. Seiko Astron uses a lithium ion battery, similar to those now used in mobile phones and other devices. However, size and reliability over time were the challenge, as such cells can break if they are recharged and discharged too often. Astron employs a new lithium ion secondary battery so small that it can easily fit into the watch case and its reliability is assured by a new IC that monitors and regulates the power charge and discharge to ensure the long life and safe operation of this rechargeable battery. This IC uses one tenth of the power consumed by mobile phone IC’s. Seiko Astron has a sensor that manages the automatic time adjustment by judging the amount of remaining energy and previous signal reception conditions. In this way, it conserves power and ensures maximum efficiency in connecting to the GPS network. Once a day, when the sensor detects solar light or other strong light, Astron automatically connects to a GPS satellite and, if necessary, adjusts the time to maintain its astonishing precision of one second every 100,000 years. When the watch is hidden by clothing or in times of low light conditions, the sensor remembers the time of the last successful time adjustment and seeks a satellite signal at that time. If the stored energy is adequate, the watch receives a signal every day. If the amount of remaining energy is low, however, the intervals between automatic time adjustments are automatically extended to conserve power. In addition, automatic time adjustment is not carried out when the indicator is showing “E” (for inadequate energy) or when the “in-flight mode” is activated. Astron’s ‘thinking’ sensor adapts to the world around it and to its wearer’s lifestyle. The new Seiko Astron collection is being presented in many of the world’s leading retail outlets including the Seiko Centers in Tokyo, Paris, Amsterdam, Hong Kong and elsewhere. After its highly successful presentation at Baselworld, Astron is being marketed this year in over 50 markets of the world and its distribution will increase further in 2013 as production capacity increases. In 1969, the Quartz Astron ushered in a new era in watchmaking. Today, the second Astron revolution is under way.